The scenario I had in mind is about an on-line e-book provider that universities use as a SaaS to allow their students to borrow e-books on-line. The users of this application (the students) can log-in with the credentials provided by their university and download password protected e-books to read offline. Each e-book can be read for a limited time period after which the password expires and there is also a monthly limit of e-books one student can download. This monthly allowance is based on the package purchased by the university the student belongs to. And here’s the initial project structure. As you probably noticed, the Add method from the StudentService class is responsible with adding a new Student to the database. We will start refactoring with this method. Although there might be a temptation to apply these principles in the order suggested by the acronym, don’t forget that it’s just an acronym and the order of the letters is not a natural order of the how the principles should be applied. The first rule is easier to understand. 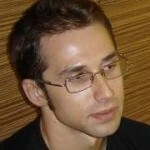 The high level modules are the ones that contain the core (use-cases and the the business logic) of the application. Low level modules are modules that perform very specific operations (often infrastructure related) which are orchestrated by the higher level modules. Looking at our example, it’s obvious that the StudentService is part of a high level module and it depends on the StudentRepository which persists students to the database and belongs to a low level module. It’s also clear that neither of them depend on abstractions. In order to satisfy the first rule it’s enough to do something a lot of .NET developers are already familiar with. 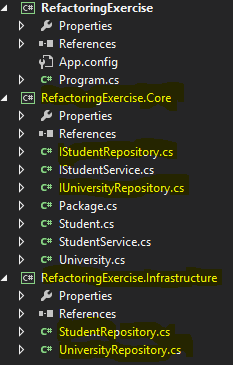 We put both classes behind interfaces (abstractions) and inject the lower level abstraction, the new IStudentRepository, into the StudentService constructor. This is Dependency Injection but it’s enough to satisfy the DIP. But what about the second rule? The second rule is not as easy to understand because it doesn’t have a direct reflection in code. It’s more about perspective and who triggers the change in the abstraction-details relationship. 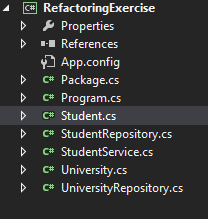 In our example, the IStudentRepository is the abstraction of the StudentRepository detail. In order to satisfy this rule any change in the StudentRepository should be triggered by a change in the IStudentRepository.